With a total of 2 motors, and 4 sensors, the ProtoBot is a very simple robot. Don’t let it fool you, though! You can still do a lot with it, especially with programming. It’s also very easy to build. In our experience, a middle schooler can build one in a few hours, including soldering the board. 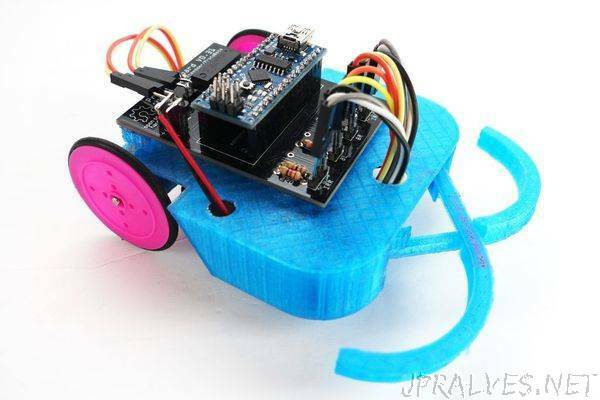 Using cheap, common components, the ProtoBot is easily sourced online. The plastic parts can be printed on any 3D printer that has a build volume of 10x10x5, or ordered from a 3D printing service online. The 2 layer PCB can be hand etched, or obtained through a PCB prototyping service. We’re passionate about robots. We also think robotics will play a huge role in our future. Because of that, we think it’s important that more youth learn about, understand, and enjoy robotics. Traditional educational robots are expensive. The ProtoBot costs under $12 in materials costs, and by having kids assemble their own, they get experience in the physical side of Robotics, not just software. This makes it easy for educators to give each kid a robot of their own- And then let the kids keep them. Open Source, Free, and low materials cost – This enables educators with limited funds to still be able to use the ProtoBots. The components are common and easily found, the software free and compatible with older computers, and the resources and learning materials cost nothing, besides the physical paper they’re printed on. Are you interested in making a ProtoBot for yourself? Hosting a MakerCamp or using them in your classroom? Doing anything else with them? You can! It’s free! Please do! We want to help you. All it costs is time and the bare materials.